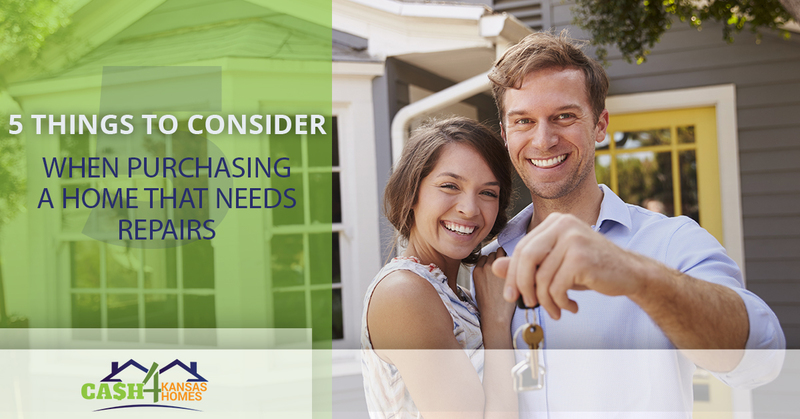 When it comes to purchasing a home in the Kansas City area, you can either opt to buy a new construction home or an older one with a little more history and character. If you choose the older home, sometimes that means pouring some money into it for repairs. Though it can be a great and economical idea to purchase a home that needs repairs, there are several things you should be cautious about before pulling the trigger. At Cash 4 Kansas Homes, we offer cash for houses in the Kansas City, Missouri area. If you’re in a situation where you need to sell your home that needs repairs, we might be the perfect alternative real estate solution for you. Our real estate experts pay cash for houses — get an offer today. As a cash for houses business, we purchase homes that need repairs quite often. Here are the five things we think everybody should consider when they decide to purchase a home that needs repairs. 1. Decide if the amount of repairs will be worth it. The first thing we consider before we pay cash for houses that need repairs is determining if the amount of repairs will be worth the overall purchase of the home. From simple paint touch-ups to difficult tasks like wiring around the property, you need to consider how much it will cost for all the repairs the home will need. If the amount to repair the home ends up being more than the actual home itself, that could pose potential, unexpected budget issues. Usually, the point of purchasing a home that needs repairs is because it is a more economical option than new construction. If that’s not the end game, then why put the time and effort in? 2. Make sure there’s room in your budget for repairs. Take into consideration the overall cost of the home as well as the amount of repairs you’ll need. If you have a set budget in mind for a home of your dreams, make sure that the repairs won’t unexpectedly send you over that amount. Pro tip: You should only spend up to 20 percent (preferably less than 10) of the property’s value in repairs. Anything more than that usually isn’t worthwhile. 3. Determine how you’ll use a room after it’s repaired. While you’re browsing the home for repairs you’d want to make, chances are you’ll want to completely repurpose some of the rooms in the home. Think about how you can turn rooms into rooms with a different purpose than they were originally built for. For example, you can turn smaller guest bedrooms into home workspaces, or knock down walls for a larger living room/kitchen area. Either way, think of the spaces in the home as more than what you initially see — every home has the potential to be something greater than they once were! 4. Look for outdated spots. For an especially older home, you might have to look for things that might be out-of-date or out-of-code. This means you might have to add new phone or wireless cable ports as well as wall jacks or outlets to areas of the home to connect your phones and computers — believe it or not, homes built in the 1940’s were not prepared for these technological advances. 5. Make sure you have the time to tackle the repairs. Sure, you might think you’ll have time to retile the bathroom floors in the home or replace the kitchen cabinetry yourself while you’re in the homebuying process. But we suggest being realistic about the time you actually have on your hands before cooking a fixer-upper home. If you work full-time, have a regular exercise routine, have children or are a leader in other extracurricular activities, will you really have time to renovate your home? Probably not, unless you’re a superhuman, of course. Living in a home that is constantly under construction can be draining, especially if all you want to do after a long day is come home and relax. Before you commit to repairing a home, just make sure that your current life schedule allows for it, or that you’re willing to have a few sleepless months. Or, you could always hire someone to do the repairs for you, if your budget allows for it. If you’re a homeowner in the greater Kansas City community looking to sell your home that needs repairs that you don’t want to tackle yourself, our homebuyers at Cash 4 Kansas Homes can provide you with a fair, all-cash offer. We purchase homes in any condition, and “cash for houses” is our business model because we believe in providing residents with a real estate solution that is easy, quick and efficient. For more information or to receive an all-cash offer, reach out to our team of real estate experts at (913) 276-0769 or by filling out our online form.